Outgoing Federal Reserve Chair Janet Yellen in March 2017. The Federal Reserve is raising its key interest rate for the third time this year and foresees three additional hikes in 2018, a vote of confidence that the U.S. economy remains on solid footing 8½ years after the end of the Great Recession. The Fed said Wednesday that it's lifting its short-term rate by a modest quarter-point to a still-low range of 1.25 percent to 1.5 percent. It is also continuing to slowly shrink its bond portfolio. Together, the two steps could lead over time to higher loan rates for consumers and businesses and slightly better returns for savers. The central bank said in a statement after its latest policy meeting that it expects the job market and the economy to strengthen further. Partly as a result, it expects to keep raising rates at the same incremental pace next year under the leadership of Jerome Powell, who will succeed Janet Yellen as Fed chair in February. "Stronger GDP growth forecasts and expectations that unemployment will continue to fall" were clearly behind the Fed's move, said Ken Matheny, an economist at IHS Markit. 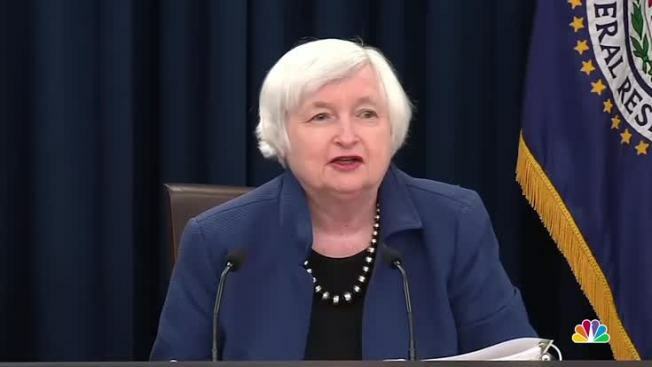 Federal Reserve Chair Janet Yellen announced an interest rate hike during a Wednesday news conference, citing a strengthening job market, increased income and rising consumer confidence as the basis for tighter credit. The Wednesday increase is the second in three months from the Federal Reserve. The Fed's action was approved 7-2, with Charles Evans, president of the Fed's Chicago regional bank, and Neel Kashkari, head of the Minneapolis Fed, voting no. Both preferred to keep the benchmark rate unchanged. The central bank's message Wednesday departed little from its recent statements. It still stresses that it expects to keep raising rates gradually. Its projections for future hikes, based on estimates of 16 officials, showed that the median expectation remains three rate hikes in 2018, at least two in 2019 and two more in 2020. By then, the Fed's target for short-term rates would have reached 3.1 percent — slightly above its estimate of a long-term neutral rate of 2.8 percent. That would mean the Fed would still be seeking to tighten credit three years from now. 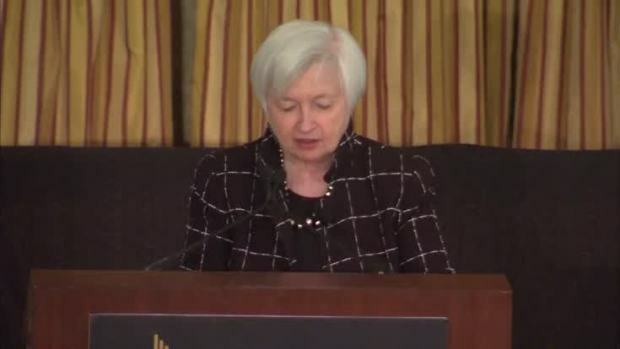 At a news conference after the Fed's meeting, Yellen said she would work to provide a smooth transition for Powell. Powell has been a Yellen ally who backed her cautious stance toward rate hikes in his five years on the Fed's board. Yet no one can know for sure how his style of chairmanship or rate policy might depart from hers. What's more, Powell will be joined by several new Fed board members who, like him, are being chosen by President Donald Trump. Some analysts say they think that while Powell might not deviate much from Yellen's rate policy, he and the new board members will adopt a looser approach to their regulation of the banking system. On Wednesday, the Fed boosted its forecast for growth to 2.5 percent next year, up from its previous forecast of 2.1 percent. But it then foresees growth slowing to 2.1 percent in 2019 and 2 percent in 2020. Those rates are far below the 3 percent to 4 percent growth that the Trump administration insists would result from its economic policies of tax cuts, deregulation and stricter enforcement of trade laws against unfair foreign imports. Federal Reserve Board Chair Janet Yellen said the Fed will likely resume raising interest rates later this month. The Fed modified its forecast to take into account that unemployment has fallen lower this year than it had expected. For the next two years, the Fed projects that unemployment will decline from the current 4.1 percent to 3.9 percent in 2018 and 2019 and then tick up to 4 percent in 2020. It also expects inflation to rise from 1.7 percent this year to 1.9 percent in 2018 and 2 percent in 2019. The Fed's inflation target is 2 percent, But it has puzzlingly remained below that level for more than five years. Even before Wednesday, most analysts had said they thought the still-strengthening U.S. economy would lead the Fed to raise rates three more times next year. A few, though, have held out the possibility that a Powell-led Fed will feel compelled to step up the pace of rate hikes as inflation finally picks up and the economy, perhaps sped by the proposed Republican tax cuts, begins accelerating. At his Senate confirmation hearing last month, Powell impressed his listeners as an evenhanded moderate who favored the kind of incremental stance toward rate hikes that both Yellen and her predecessor, Ben Bernanke, embraced. A Senate committee approved Powell's nomination and sent it to the full Senate, where his confirmation is considered certain. In his view of the Fed, Trump has made clear that he favors low rates. But the president has also expressed a desire to pull back on many of the regulations that were imposed on banks after the 2008 financial crisis. Trump and many Republicans argue that those regulations are too burdensome, especially for smaller banks. Powell himself has sent some signals that he agrees. It was in the midst of the 2008 crisis that the Fed cut its key rate to a record low near zero and left it there for seven years. Eventually under Yellen, the Fed responded to a steadily improving job market and economy by modestly raising the rate — in December 2015, in December 2016 and now three times this year.